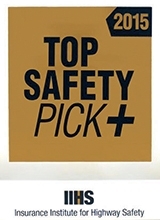 The Insurance Institute for Highway Safety added its more demanding Top Safety Pick+ rating in 2012. And every year since, the group has made the rating tougher to achieve. The TSP+ was launched to supplement the long-running Top Safety Pick award by incorporating results of the institute's small-overlap crash test, which began the same year. In the first year of TSP+, vehicles had to earn an "acceptable" or "good" rating on the small-overlap test -- on a scale that also includes "marginal" and "poor" -- to earn the award. Four other tests are factored in: the front moderate-overlap crash, side-impact crash and rollover tests, plus evaluations of how well seats and head restraints prevent neck injuries in rear-end crashes. To qualify for the award, a vehicle has to earn at least a "good" rating on four of the five tests, and no less than "acceptable" on the fifth. In the 2014 edition of the awards, IIHS incorporated crash-prevention systems as a TSP+ criterion. To qualify, vehicles must earn a "basic," "advanced" or "superior" rating for crash-prevention systems. These systems must at least include a forward-collision warning, and some have automatic braking features. Systems rated as "basic" typically have the warning, and vehicles receiving "advanced" and "superior" ratings generally have automatic braking features. For the 2015 award, vehicles rated "basic" no longer will qualify for the TSP+ accolade.